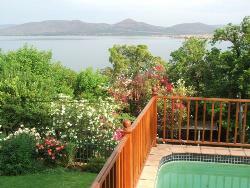 Cradled in the harmonious valley of the Hartebeespoort dam & Magaliesberg mountains, you will find The Dragon Fly house! It is a warm & alluring self catering Luxury House located in the quaint & serene village of Kosmos. It has miles of spectacular view of both the dam & the mountains. It accommodates 10 people! And is serviced everyday! Experience tranquillity not known to many! On entrance you will find refuge in the peaceful garden, with its slow trickling water outside of The Garden Suite. The Dragonfly is known for its beautiful shaded patio/ entertainment area & magnificent dam views. The patio consists of an outdoor dining area, braai facilities and a trendy bar, with all around sliding doors. The bar has Its own LCD TV for the sports fans, sound system and mini-casino. The entertainment area is level with a sparkling splash pool. Where you can relax, sip cocktails and gaze at the breath taking sunsets. Later in the evening you can do some star gazing with the telescope. 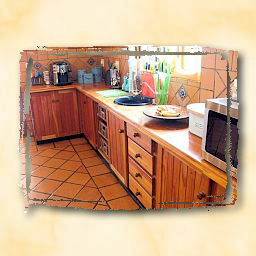 The Kitchen opens out onto the patio, it is more than fully-equipped. The main Dining room is open plan to the Lounge and has large sliding doors onto the entertainment area. Just in case you are visiting in the chilly winter, you will find a gas fireplace to warm your chills away. The Lounge has a plasma TV, dstv, mnet, aircon/heater and a Snugly, Comfy couch which could easily accommodate an extra body or two! 5 beautifully furnished bedrooms, all linen & towels provided. 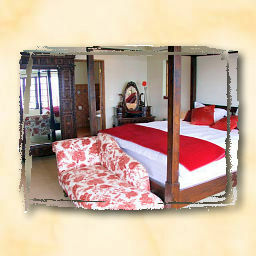 The Main Bedroom has a king size four poster bed, where you can laze and watch telly on your LCD TV . an en-suite bathroom with a Victorian bath & shower, large walk in cupboards and a balcony with panoramic views. The 2nd & 3rd bedrooms also have breathtaking dam views and queen size beds. The 4th , has a inspiring mountain view and two single beds. There is a shared bathroom with both bath & shower. The Garden suite is found in the serene garden. It has all the same amenities as the other rooms, as well as TV/DVD and own en-suite shower. There is a treadmill for the exercise-holics and an office area for the work-aholics! -a relaxing getaway for large families and friends – the -house is child friendly with gates on all stairwells, to be -used at your discretion and a pool net and pool gate. Pool -net fitted on request. -for an all out crazy party. So all in all perfect for Everything & Everyone! Soothe your soul and have a truly memorable experience at The DragonFly House.